Getting back to the prettier side of Paris … we passed by an apartment building that overlooked a busy street where someone clearly wanted to see something more from their windows than people and cars. I was impressed by the way they had created a garden right outside their windows. If you click on the images, you can just about make out how they did it. While I have always had trouble keeping even a houseplant alive, I’m hoping to add a new level of skills (okay, maybe only design) to what I already know. With that in mind I am always snapping photographs of appealing gardens and this one got high marks for both beauty and creativity. If you have a favorite garden spot (hopefully your own) and send me a photograph in an email, I will include them all in one big garden post later. This entry was posted in Adventure, Travel and tagged Cornwall, Elizabeth Harper, Garden Design, Gifts Of The Journey, Paris Gardens, Pick Pockets, Sightseeing, Sydney Eddison. Bookmark the permalink. I’ve never seen anything like that. 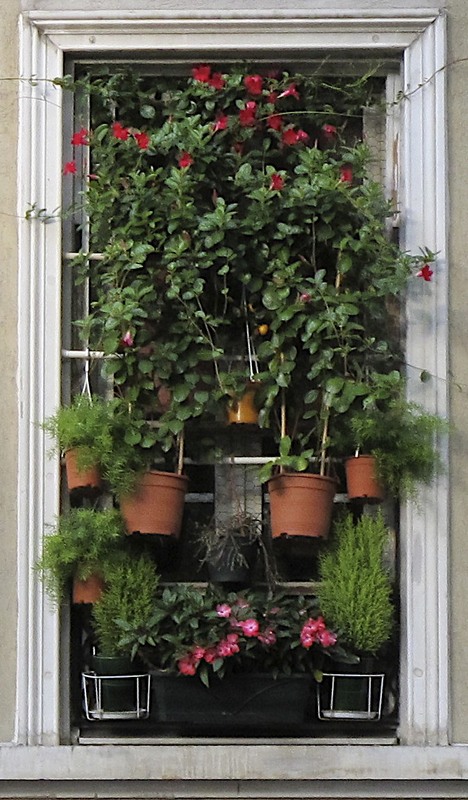 I LOVE window boxes. I think they’re beautiful, but I don’t know if I like the idea of the whole window blocked. I like the sunshine too much. I imagine it would be dreary inside. If you saw my garden, I know exactly what it would tell you about me…..I’m too busy to take care of it! Every spring I think it will be different. I will faithfully work in the garden, and it will be beautiful. Then it gets SO hot and I get too busy. This is the time of year I just quit caring. I’m ready for fall. I’m so glad you’re enjoying Paris. I want to go there some day. I may put some marigolds here and there for bug control, but mostly I want to grow food. I’m curious about the young woman: How did you catch her? Did you feel her hand go into your pocket? Did your companion see her do this? Did you yell, or grab her wrist, or what? And did you get one good swing at her? I would have smacked her, really hard, while yelling “HOW DARE YOU?” (in English, alas, I have maybe three words of French). Sure, I might have gotten hit back, or arrested, but on the other hand other potential pickpockets in the area might have decided not to mess with the crazy American chienne. I live on a 10 acre lavender farm surrounded by farmland so I have quite the “garden” view. This is so very creative..and just as I’d imagine what one might find on the streets of Paris. So inspiring…and – I love how you’ve captured it here! 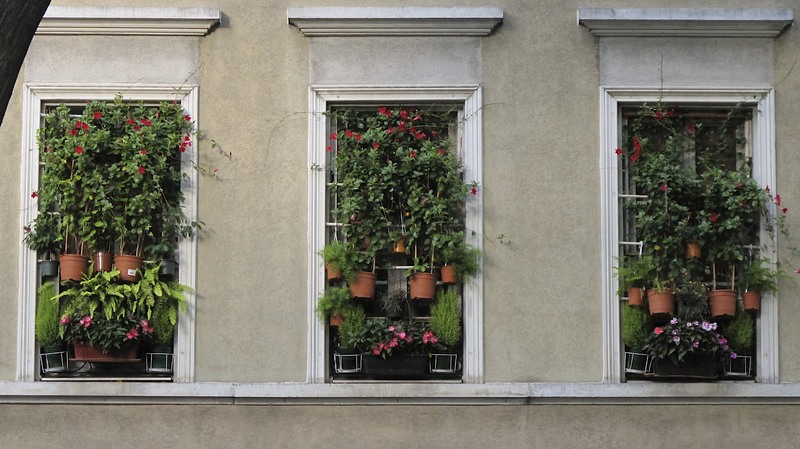 What great window boxes! I’ve seen vertical succulent gardens here in California and I love the idea, but those are more lush. I’m with you, I have the theory of being a good gardener much more than the reality. When we moved into a house back in Baltimore with a yard I thought I’d be out there planting veggies and being Lady Bountiful or something. Some kind of earth goddess. Instead I discovered that I like a project, but I don’t like maintenance–so veggies were out. I’m ok for a once a year prune or a raking session, but not daily weeding. Aside from all that, I love that you’re both in Paris! Have a wonderful time. Your beach photos were beautiful. They remind me of some of the beaches in Northern California, though yours are much greener up top. I think that if I am getting rid of gardening books, you might be my first port of call rather than the charity shop? Look up John Brookes’ books, they are really nice. I’m a weeder. I kills plants, but I weed like a demon.